This past Thursday, thanks to uncertainty around the U.S. and China trade deal, fear of slowing global economic growth, a roughed-up stock market and the likelihood of fewer Fed rate hikes, the bond market and home loan rates hit their best levels in three months. 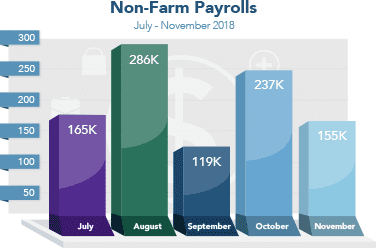 On Friday, the Labor Department reported that 155,000 jobs were created in November, a bit less than expectations of 189,000. The labor market remains incredibly strong and wages are rising at fastest pace in a decade. Low rates coupled with a solid labor market and rising wages make for great home purchase conditions. It appears the highest home loan rates for 2018 are behind us. With low inflation and low bond yields in Europe and Asia, our home loan rates should not go much higher in the foreseeable future. That is great news as we head into 2019. That said, the last time bond prices were at current levels, they moved lower pretty quickly causing interest rates to spike. If history repeats itself, last Thursday’s intra-day and multi-month low may serve as a near-term bottom in rates. There is a slew of important economic reports set for release which can keep the volatility going, including the Consumer Price Index (CPI) which gives us a reading on consumer inflation. What will be interesting to follow is how the bond markets react to a total of $78 billion in Treasury notes and bonds being sold this week with yields near 3-month lows. If investors don’t like the lower yields and the auctions don’t do well, rates may tick higher. The wholesale inflation reading Producer Price Index will be released on Tuesday with the more critical Consumer Price Index on Wednesday. The other key report to watch will be Friday’s Retail Sales Report. If you or someone you know has any questions about home loan rates, please give me a call. I’d be happy to help.